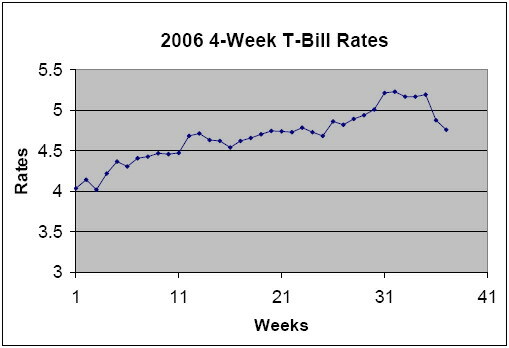 After peaking at 5.227% APY on August 8th, the yield of 4-week T-Bill has been on the decline. The auction of last Tuesday set the latest rate at 4.757%. I have increased my weekly purchase of 4-week T-Bill to $3000 last month, mainly for its higher rate. Though the earnings from T-Bills are exempted from state taxes, I may have to rethink about my position. Compared to EmigrantDirect, which pays 5.15% APY with a minimum deposit of $1, the yield of 4-week T-Bill is not as appealing as it was only a couple of months ago. The drop in yield is mainly due to the perception of a mild inflation. After 17 consecutive interest rate hike, the inflation is seen under control, which is confirmed by this morning’s PPI report from the Labor Department. According to the report, producer prices rose 0.1% last month, and the core rate, which excludes food and energy costs, actually dropped 0.4%. Meanwhile, new home construction dropped 6% in August from July, fifth decline in the past six months. As the economy cooling and inflation easing, the Fed is expected to hold interest rate steady when they meet this week. All of these are not likely to help the yeild of T-Bills in the near term. Since buying T-Bills through TreasuryDirect is very simple, I can always switch back should the yield go up again. For now, EmigrantDirect may be a better place to park our cash.